(A) Upper endoscopy on admission revealing acute necrotizing esophagitis with sloughing and darkening of the mucosa. (B) Follow-up upper endoscopy demonstrating partially healing esophagitis with no sloughing. (C) Low and high power microscopy revealing fibrinopurulent exudate and granulation tissue. A 49-year-old physically active man presented to our emergency department with sudden-onset ongoing massive hematemesis of 1-day duration. A system review was unrevealing except for poor appetite for 2 to 3 days before presentation. His history was negative for any significant alcohol consumption or nonsteroidal anti-inflammatory intake. He denied taking any prescription or over-the-counter medications or herbal supplements. He had used occasional crack cocaine and marijuana, with the last use approximately 4 days before presentation. On physical examination, the patient was hypotensive (blood pressure of 59/34 mm Hg), hypothermic, and confused. The patient did not have any abdominal tenderness or stigmata of chronic liver disease on clinical examination. Laboratory assessment revealed hemoglobin of 9 g/dL (13 g/dL, 2 months ago) with a white blood cell count of 5.6 × 103 mm3 and platelet count of 156 × 106 mm3. His blood chemistry was normal, and serum lactate level was 5 mmol/L. 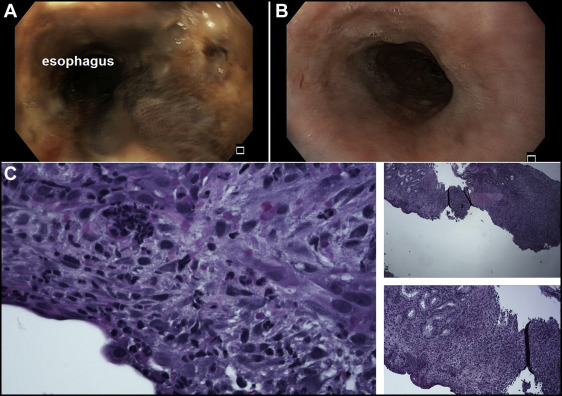 After emergency intubation for airway protection, he underwent esophagogastroduodenoscopy revealing diffuse necrotizing esophagitis with sloughing of the mucosa predominantly in the distal third of the esophagus (Figure A). Further workup was negative for any bacteremia or underlying diabetes. With supportive volume management and transfusion, his lactate quickly normalized. Age-appropriate screening for malignancy was negative. A repeat endoscopy 2 weeks later showed marked improvement (Figure B). Biopsy was done at this time, which revealed fibrinopurulent exudate and granulation tissue (Figure C) with negative immunohistochemistry for herpes simplex, cytomegalovirus, and Helicobacter pylori. Acute necrotizing esophagitis or “black esophagus” is rare, with an estimated incidence of 0.01% to 0.28% on autopsy series. Anatomic location of acute necrotizing esophagitis in the distal esophagus, a relative “watershed” territory compared with the more vascular proximal and middle esophagus, suggests an ischemic cause. A combination of ischemic zone, corrosive injury secondary to reflux, and compromised mucosal defenses is the proposed pathway for its development, and various risk factors have been associated more frequently, namely, malnutrition, substance abuse, alcohol, diabetes, hypertension, and malignancy. Endoscopic identification of diffuse circumferential discoloration of the distal esophagus is the hallmark for diagnosis with biopsy needed only to avoid masquerading infections. Gurvits et al described 8 patients in a large multinational series and identified the presence of hypoalbuminemia, anemia, renal insufficiency, and hyperglycemia as common laboratory abnormalities. Treatment includes initiating aggressive acid suppression, optimizing vascular flow to the esophagus, and reversing the underlying comorbidities. A mortality rate of 13% to 32% has been reported. Morbidity commonly is associated because of stricture formation in approximately 25% of patients. Black esophagus is a rare but important cause of upper gastrointestinal bleeding. Our patient presented without any known risk factors. Further, our case is unique in the fact that a follow-up endoscopy established resolution of the finding providing insight into the natural history of the disease with supportive management. A higher awareness, early endoscopy, and supportive management are key for these patients. This article originally appeared in the October 2016 issue of The American Journal of Medicine.